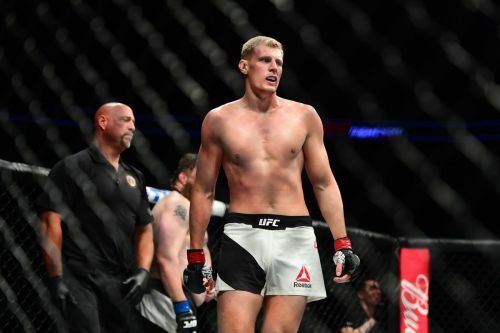 Russian fighter Alexander Volkov is currently one of the fastest rising fighters in the UFC's Heavyweight Division, and prior to his showdown against Derrick Lewis at UFC 229, Volkov feels that he deserves the next shot at the UFC Heavyweight Championship if he's victorious this Saturday. Alexander Volkov made his Professional MMA debut in 2009 when he signed for M-1 Global and defeated Nikolay Pleshakov by TKO in just 80 seconds. Five years after his M-1 Global debut, Volkov won the M-1 Global Heavyweight Title by defeating Denis Smoldarev via submission. Simultaneously in 2012, Volkov fought and defeated Richard Hale to win the Bellator Heavyweight Championship, and it wasn't until September of 2016 when the Russian fighter was signed by the UFC. Currently coming fresh off a win over former UFC Heavyweight Champion Fabricio Werdum, UFC Heavyweight prospect Volkov hopes to receive a shot at the Championship if he is victorious in his upcoming fight over Derrick Lewis at UFC 229. “It’s a difficult situation. There’s Daniel Cormier, Brock Lesnar, and the winner of Francis Ngannou and Curtis Blaydes. So, either the winner of Lewis against me, or Ngannou against Blaydes, could earn the title shot. I don’t like to think about when exactly my title shot will be, but I believe that if I show a good performance, the UFC will give me the opportunity to fight the champion next. Also, we don’t know when the title shot will be for sure." Alexander Volkov and Derrick Lewis will lock horns this Saturday at the T-Mobile Arena in Las Vegas, Nevada as part of UFC 229. UFC News: Junior dos Santos and Derrick Lewis to headline UFC event soon?